Today a large number of photos are being taken through mobile phone cameras. Many phone brands claim to give DSLR like picture quality. Unfortunately, this is a lie and if you want to take high-quality pictures or want to have a greater control over the settings of your camera, a DSLR camera is what you are looking for. 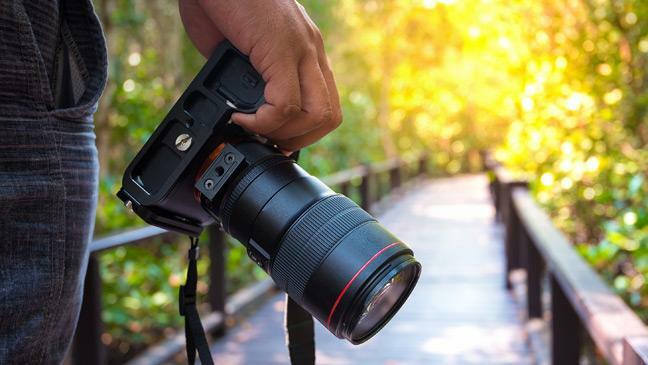 There are lots of inexpensive DSLR cameras out there and with a budget of ₹20,000 and with the help of Croma coupons you could get a great DSLR camera to take some breath-taking photographs. There is one problem though while searching for the perfect camera you would come across hundreds of different options to choose from. Now, not all of these cameras are made equal and some are the best bang for your bucks whereas others are just glorified point and shoot cameras with a few additional features. In order to make your selection process a lot easier, we have compiled a list of 7 Best DSLR cameras under ₹20,000. Let us take a look at it, shall we? The DSC-H300 is a great camera considering the budget is only ₹20,000. It is an ideal option if you want to take different kinds of photos. Although the camera isn’t a true DSLR, it still offers many features that you would find in a DSLR camera. It has brilliant manual options and the photos that you take will come out magnificent, regardless of the condition. It is compact yet powerful and can be carried quite easily. It comes with a 20 MP sensor and offers a 35X optical zoom. You also get a 3-inch LCD display which provides a good idea of what you are shooting. You could get the DSC-H300 for ₹15,990. When it comes to cameras, Canon is arguably the most famous brand in the world. PowerShot SX540HS is probably the best camera that you could get under ₹20,000. It offers the best quality photographs, especially at this price point and comes with a 20.3 MP sensor which is 1/2.3-inch in size. This gives you pictures with a resolution of 5184 x 3888 pixels. The ISO settings are decent as well and you could select from 80 to 3200 as the ISO value. This is the ideal camera if you are looking for an inexpensive DSLR or want to try photography for the first time. The camera is available on Croma for ₹20,995. Use the Croma promocode for a discount. If you are a travel photographer then PowerShot SX430B is made for you. It is a budget-oriented DSLR camera which doesn’t compromise when it comes to features. Being designed for travel photography, the camera is compact and doesn’t weigh a lot. The best thing is that the controls are fairly easy to understand and anybody could use the camera without much effort. The camera features a 20.5 MP CMOS sensor which is 1/2.3-inch in size. The camera also features a 45X optical zoom so that you can capture distant objects clearly and it gives excellent photos even in the low-light conditions. If you are interested in travel photography and want an inexpensive camera then you could get this model for ₹15,595 only. If you want a camera that is not only easy to use but gives an excellent image in nearly any condition then H400/B from Sony would be an ideal choice. Just like DSC-H300, it might not be a true DSLR but you won’t notice a difference unless you are a professional photographer. There are plenty of manual settings and options to choose from so that you can take the perfect photo in any condition, yes it means low-light as well. The 20.1 MP sensor and 63X optical zoom are just too good at this price. It also comes with an optical image stabilization feature. At the price of ₹22,490, it might seem a bit expensive but you could easily get a discount on using Croma promocode. If you are looking for a relatively inexpensive but brilliant camera then Coolpix P500 should be a great option. It features one of the most versatile lenses that you will see in any camera at this price point. It also features a 36X optical zoom and 12.1 MP sensor are more than enough to take extremely detailed and clear photos in any lighting. It has a 3-inch LCD screen and you can use it to record 1080p videos as well. Being one of the most versatile cameras and costing just ₹19,999. SLT A58Y is one of the best DSLR at this price point and the best that Sony could offer. It features a 20.1 MP CCD sensor and comes with an ability to record videos at 1080p. You also get a 2.7-inch LCD display and has a tripod socket so that you could take the best quality pictures, even in low light. The camera is great and could be yours for just ₹20,999 and you could get a discount on using Croma promocode. EOS 1300D is the best DSLR that you can find on the market at this price point. It is an excellent choice and comes with all the features that you would want on a DSLR camera. The picture quality is exceptional as well thanks to the 18 MP CMOS sensor and 35X optical zoom. It not only lets you shoot brilliant pictures but records 1080p videos as well. It is quite simply one of the most versatile cameras on the market. You could get it for ₹19,999 only. So, these are some of the best DSLR cameras that you could buy for ₹20,000. As you can see that they come from some of the most popular and reliable brands so you could choose any one of these and you won’t be disappointed with the results.